SYNOPSIS: ~ Two made-for-TV cops & robbers rarities from director William Graham. Thief: Richard Crenna gives one his best and most complex performances as a career criminal in this solid drama. He plays an ex-con who sells insurance but still robs houses for jewelry on the side. He has a rotten ex-wife and a son he wants to get custody of. The lawyer bills, not to mention his gambling debts to the mob, force him to pull the classic "one last job". He's the kind of thief who can wear a suit and tie and steal your valuables without you even knowing it! Angie Dickinson is his live in girlfriend and the great Cameron Mitchell plays his exasperated lawyer. Highly recommended. Mr. 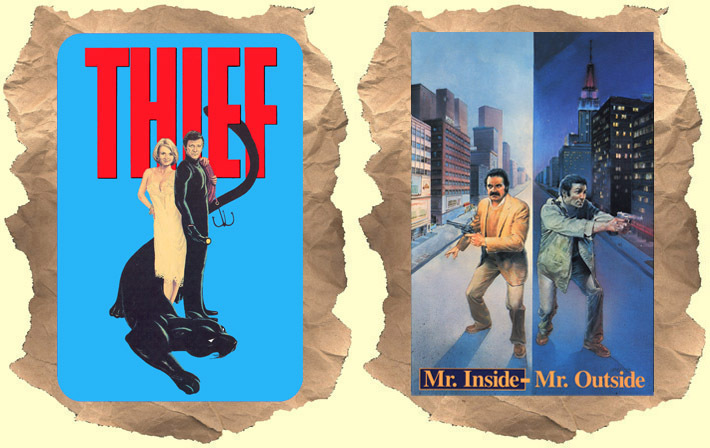 Inside - Mr Outside: On the other side of the thin blue line we have Tony Lo Bianco and Hal Linden as veteran NYC detectives. They are hot on the trail of dope dealers using diplomatic immunity laws to get their drugs into the U.S. Without giving anything away - the film title does have meaning and it involves a shocking twist pretty early in the plot. Character actor Paul Benjamin (Escape From Alcatraz) gets a rare good guy role as the police chief.This film has a real gritty feel to it. Except for the lack of profanity and blood you might not guess it was TV movie. There's excellent location footage of NYC circa 1973 to check out. Produced by Phil D'Antoni ( The French Connection, The Seven Ups).